From Big Sandy Lodge, the Fremont, Lowline, Highline, and Big Sandy trails will take you to 40 different lakes. 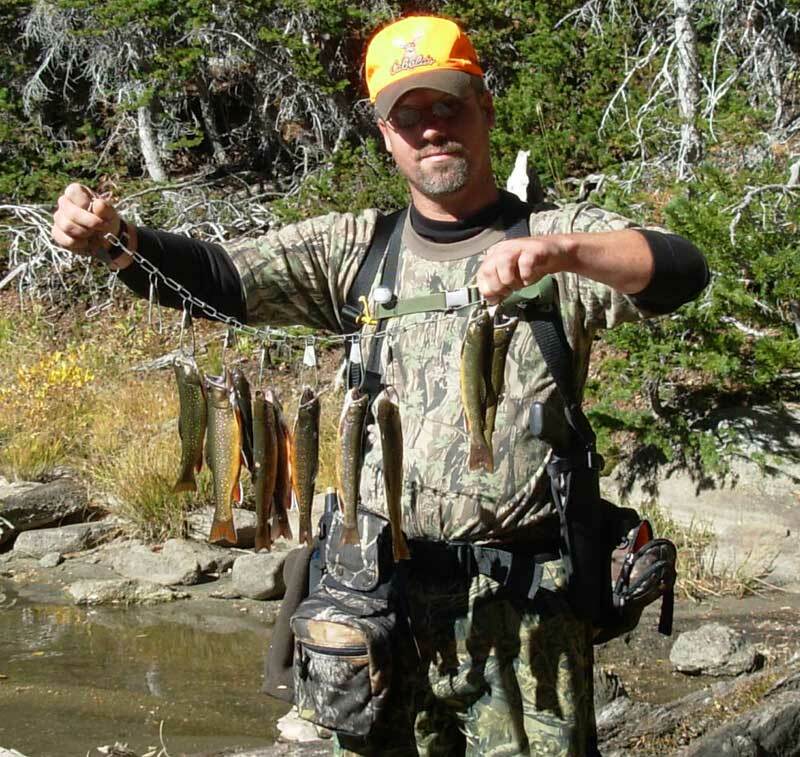 Six different species of trout await the avid angler! Most lakes are within 8 miles of the lodge. Some of the more remote lakes are within 15 miles. How early can you get in? That depends, of course, on the weather each year and when the snow melts. Some years we can get up to the lodge in mid to late May and the snow doesn't fly again until mid-October. We can't predict the exact date until we get into the spring. Access by horse begins in June, before then we hike in. Great fishing is available in the nearby lake just a few steps from your cabin door! Please call for more information if you want to get in very early in the season. We do not sell fishing licenses at the lodge, so please be sure to get your licenses in town before you come up. Horseback is a terrific way to explore the Wind River Range, and especially for those whose time doesn't permit hiking the magnificent mountains. Our guides will lead you to the destination of your choice. You will return to the lodge in time to have the evening to yourself for fishing or relaxing. Travel from Big Sandy Opening in the Bridger-Teton National Forest and Wilderness Area and enjoy excellent trout fishing, spectacular alpine scenery and secluded camping in breathtaking surroundings. We furnish all supplies, equipment, Wrangler/Guide, cook, and horses. Bring your personal gear, sleeping bag, fishing equipment and camera. Your trip is planned to meet your specifications. See our Rates page for specific price details for this season. Our Packer/Guides will take you and your gear to your choice of destinations in the Bridger National Forest and return for you at the end of your stay. If your party chooses to hike in and/or out, we can pack all or part of your gear. Trips over 12 miles by special arrangement. See our Rates page for specific price details for this season. 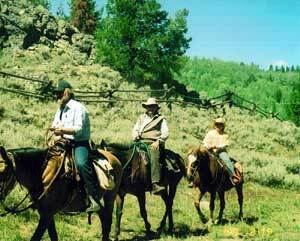 Should you choose to stay and bring your own horses we have corrals available on a first-come, first-served basis. Guests provide feed and care. Water is available. Horses coming from out of state need to have proper health certificates. Hay and pellets brought in must be certified weed free. Up to two horses per corral, $35/night. Please contact us via email. When inquiring, please be sure to include your PHONE NUMBER so we can call you back and confirm your reservation. It may take 2-3 days to get back with you by e-mail. 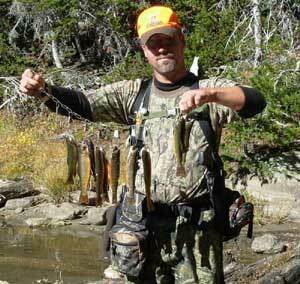 An experienced Guide will accompany you on your trail rides and fishing trips. Your Guide will introduce you to the majestic alpine scenes common to the wind River Mountain Range. You can fish the crystal streams and lakes. Photographic opportunities abound in the profusion of wild flowers, birds and animals. Towering mountain peaks make picture-perfect scenes. These horse rides are tailored to your specifications. Children must be at least 8 years to ride (NO DOUBLE RIDING ALLOWED).